Beautifully engraved SPECIMEN certificate from the Lafarge Corporation. This historic document was printed by British American Bank Note Inc. and has a block border with a vignette of 3 workers looking over papers and designs. This item has the printed signatures of the Company's President and Secretary. LAFARGE CORPORATION. Lafarge Corporation, with headquarters in Washington, D.C., is a multinational cement producer and operator of coal mines, chemical plants, sugar refineries and paper mills. The company traces its origins in the United States to six plants built by plant designer and engineer William Foster Cowham, beginning in 1901 with the country's first electrically driven cement plant at Cement City, Michigan. The six plants, known as the Cowham System, sold products under a number of different brand names. When Dallas contractors in 1907 complained of insufficient supplies of cement for sidewalks, Cowham acquired nearby limestone and schist deposits and founded Southwestern States Portland Cement. The company's Eagle Ford mill, located ten miles west of Dallas, supplied much of the cement used by the expanding city. By 1915 the firm was known as Trinity Cement, named for the Trinity River, and by 1933 plants were in operation at Dallas, Fort Worth, and Houston. Trinity was located on the railroads and shipped its products in barrels and bags to New Mexico, Louisiana, Mississippi, Arkansas, Indian Territory, and Oklahoma, and soon developed both new products and technology. Cowham was succeeded after his death by his son-in-law, John Lawson Senior, who formed Cowham Engineering Company in Chicago in 1913 and soon gained control of Trinity. With East Texas Oil, Trinity developed an oilfield cement known as Trinity Inferno for use under high temperatures in oil wells, and in 1940 another variety known as Trinity White Portland, made from oyster shells dredged from Galveston Bay. After Senior's death in 1946, Trinity merged with two other Cowham companies to form General Portland Cement Company, a Delaware corporation and the nation's fifth largest firm, with headquarters in Chicago. Smith W. Storey served as president and later chairman of the board. Between 1947 and 1962, the company continued to expand, responding to the industrial development of the Texas Gulf region and growing defense requirements. With a 1959 merger with Consolidated Cement and the acquisition of aggregate reserves, the company also obtained a short-line railroad in southern Louisiana and other facilities that allowed it to reach a total of nineteen states. Among its other Texas acquisitions, General Portland acquired in 1965 the Rackle Company in Houston and the Southwest Stone Company in Bridgeport. John B. Connally, who joined the board in 1968, supported the company's efforts in the construction of Dallas-Fort Worth International Airport, and in 1967 the corporate offices moved to Dallas. Three years later the company acquired Pacific Western Industries, with cement plants in California, diversified into land development and furniture retailing, and, to reflect its increasingly varied operations, adopted a divisional structure and changed its name to General Portland Industries. Sales declined in the 1970s, and the firm closed its Houston facility in 1976, but in 1981 responded to new developments in the Northeast by acquiring the Whitehall Cement Manufacturing Company. Annual productive capacity of General Portland was six million tons in the 1980s, when it was America's third-largest cement producer, with 2,500 workers employed at ten cement plants nationwide. In 1981 the Lafarge Coppee Group, a major French producer attracted by the company's success, mounted a takeover bid through Canada Cement Lafarge that resulted in its acquisition of the firm. 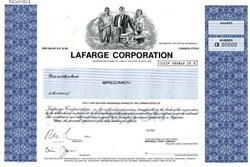 In 1983 General Portland and Canada Cement Lafarge became operating subsidiaries of Lafarge Corporation, a Maryland corporation listed on the New York Stock Exchange. The parent company, Lafarge Coppee, the world's second-largest cement maker, began in France in 1833, and developed through the combination of four separate enterprises: Lafarge in France, Coppee in Belgium, Canada Cement in Canada, and General Portland in the United States. Auguste Pavin of France established Lafarge to manufacture cement in 1833. Though the company first produced lime for building projects, business increased as demand grew for Portland cement, known for its color, which resembled stone blocks quarried on the Portland Peninsula in the English channel. Syrian Paul Daher, the firm's manager in 1884, combined the business with his family's shipping firm, and by World War Iqv the company was the largest lime producer in the world. It incorporated in 1919 as Chaux et Ciments de Lafarge et du Teil, and listed its stock on the Paris Bourse four years later. Shifting from lime to cement in the cement famine before World War II,qv the firm became the French market leader. In competition primarily with Holderbank of Switzerland and the Blue Circle, or Associated Portland Cement Manufacturers, a merger of British firms, the company was known in 1947 as Ciments Lafarge and had begun to expand in the direction of Canada and Brazil. 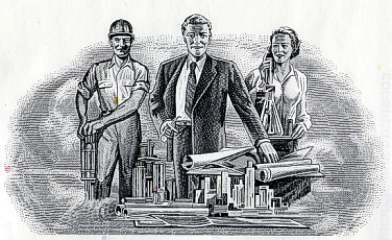 It started Lafarge Cement of North America in 1956, set up subsidiaries in Canada, and in 1967 undertook a joint venture known as Citadel Cement Corporation with Bob Hutton of Lone Star Cement in Texas and Canada Cement Lafarge. Between 1959 and 1969 Lafarge's output doubled, and its workforce increased from six to 12,000. By 1973 the multinational company turned out twenty million tons of cement annually. In 1974, with 27,000 workers and 4.9 billion French francs in sales, the firm split into Ciments Lafarge and Ciments Lafarge France, a holding company. In 1980 the firm merged with Coppee, a Belgian firm that grew from the work of engineer Evence Dieudonn� Coppee. With the addition of General Portland to its holdings, the Lafarge Coppee group moved to the forefront of the industry in North America. "LAFARGE CORPORATION." The Handbook of Texas Online. [Accessed Mon Apr 26 20:04:16 US/Central 2004 ].